← Pro vs. Amateur: A Swing Apart? On Saturday, June 3rd, 2017, our travel group had the pleasure of playing TPC of Myrtle Beach in Murrells Inlet, SC. For visitors to the southern end of the Grand Strand, this Tom Fazio design is in the the top tier of courses along with True Blue, Caledonia, and Pawleys Plantation. Most golf courses have one defensive feature whether it be fast greens, narrow fairways, or whatever. TPC has them all. The course is lined with tall pines and strategically placed fairway bunkers that frame long difficult tee shots. There are deep green side bunkers, plenty of water, and fast Bermuda greens. An outing here is not for the faint of heart or those with crooked drivers. Bring your A-game, plenty of golf balls, and prepare for one heckuva challenge! TPC was built in 1999 and has a prestigious history. The course hosted the 2000 Senior PGA Tour Championship (won by Tom Watson) and is the present day home to the Dustin Johnson School of Golf. 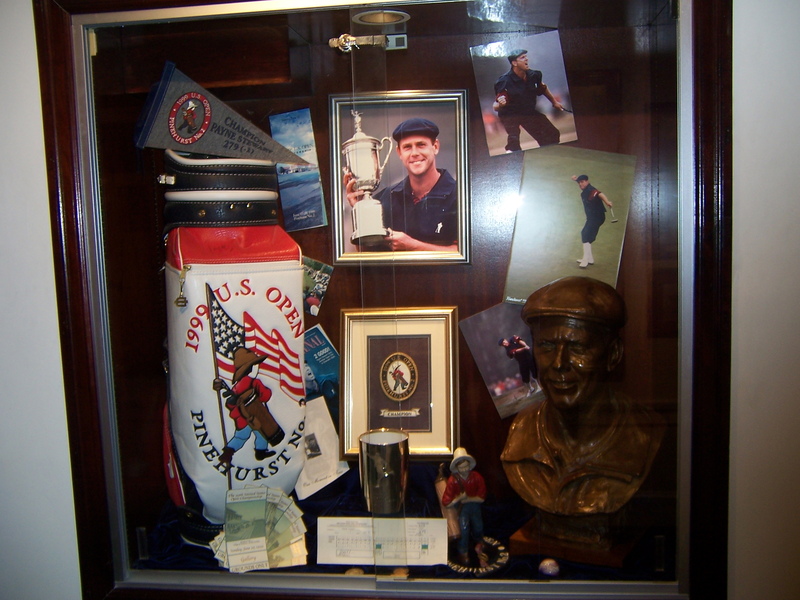 Inside the clubhouse are several cases smartly displaying DJ’s memorabilia, and the presentation reminded me of the Payne Stewart display at Pinehurst. After checking in, we started the morning by warming up at the fabulous short game area. The bunkering and approaches were neatly manicured and there were ample spots to set up for all kinds of shots without getting in your neighbor’s way. I don’t usually take sand shots before a round, but the bunkers were beautiful and inviting, and the prospects of visiting sand during the round were high. When you check in, the bag drop guys get you on a cart immediately which allows you to drive to the range. The grass stations were beautiful, the balls complimentary, and everything was in top shape. At the end of the driving range was a medium sized putting green. If I had a minor pet peeve it was that you couldn’t easily walk to the putting green from the clubhouse and staging area. It seems like it was designed to have players putt last, and right up to the time before they teed off. Again, minor issue, but if I just wanted to come out and putt, the jaunt to the area would be a little inconvenient. The course was double teeing and we were sent off #10. I find the back nine here more difficult than the front and #10 is a tough hole to start on. While only 360 yards from the blue tees, the tee shot is tight and water comes right up to the front of the green. Sure enough, I rinsed my approach, but manage to get up and down from 100 yards and was thrilled with my bogey 5. We started our afternoon round on #1 which is a par-4 of roughly the same length but has a little more room off the tee and no water guarding. For some reason my eye doesn’t fit #10 and I recall struggling there in previous rounds. Given my druthers, I’d start on #1 every time. The front nine features three par-4s over 425 yards and #9 actually had the tees at the back markers and was playing 472 yards. Oddly enough, I was more comfortable hitting driver and a fairway wood into these longer holes than some of the shorter par 4s that were tight and well bunkered. The premium on the par-5s is the second shot. You don’t need a fairway wood but MUST stay out of fairway bunkers and water. In short, there’s a premium on excellent ball striking. The greens are fast but are not tricked up. You have to avoid some of the mounding that surround the approaches because pitches from these lies to fast greens are difficult. A word of caution on the par-4 15th hole. The fairway runs diagonal and you must carry a marsh on the left and avoid woods on the right. Take your range finder and shoot a comfortable distance on the far bank of the marsh to aim for. I didn’t measure, thought I hit a perfect drive, and ended up in the woods and with a seven on my scorecard. We played the blue tees at 6,600 yards and normally that’s a comfortable distance for me. Out here, I’d say if you have a handicap of 5 or less, those markers are suitable but if your iron game is off, as mine was, you’ll get punished. You’ll have a better chance to score playing the whites at 6,193. Next time I may just try them. As part of our Founders Group package, the cost to play TPC was $109. Our replay was only $42 which was a genuine bargain for a course of this caliber. After 27 holes, the lightning detection system went off and they had to clear the course. It never rained but after a brief delay, we elected to call it quits and the course provided a 9-hole rain check which was good at any time. At this price and the quality of operation and facility, this is a very good value. Looking down at #7. Par 3, 176 yards. The bag drop staff were excellent and had us loaded literally as soon as we arrived. There was no waiting around to get set up and the organization of the place was evident. The marshals on the course were courteous and had supplies of cool drinking water on their carts. There were ample supplies of water at rest rooms and rest stops which is important when it gets hot and the humidity is stifling. The lady running the beverage cart seemed a bit disinterested in servicing the players and was more focused on just completing her rounds of the course. She did stop in the afternoon when one of our players made a point to flag her down. I will be back to TPC and try my luck again next time I’m in Myrtle Beach. This is an awesome golf course from the point of layout, conditioning, and operation. Everything about TPC is first class. Good luck if you give it a try! This entry was posted in Course Reviews, Myrtle Beach, Travel and tagged course reviews, Golf, Myrtle Beach, photography, sports, TPC of Myrtle Beach, travel. Bookmark the permalink. Glad you enjoyed it. It’s not one of my favorites and I think I got it a bad time for its conditioning. it seems like that has improved. That is the beauty of course though as we all have differing opinions. I personally wouldn’t put it with Caledonia and True Blue, but that is just me. That is what is fun about discussing courses! Hope you enjoyed/are enjoying the time in my home state! Jimmy, I always have scored better at True Blue and Caledonia. TPC kicks my rear every time but I’m gonna win some day! Conditions were outstanding during this time through. I have never had an issue with them. Good to hear Brian. I may have to go back one day. I enjoyed your review. The TPC looks like a great place to play and I like how you mentioned if the price was of value for the course. That comment is very important to most readers, in my opinion, as it provides an endorsement of whether to play. I am looking forward to your other reviews of your trip. Thanks Jim. it is a good value but folks need to know that if they are not on their game, they are in for a long day. Missed shots at other courses usually allow you a chance for recovery. Not so much the case at TPC. That being said, I love the challenge and will always play it given the opportunity. Nice review. You’re making a case to plan my first golf trip to the eastern US — keep em’ coming! Josh, there’s a ton of great golf in the Myrtle Beach area. Super courses and great packages available. Prices usually drop considerably after Memorial Day. That’s when we go every year. If you’re serious, let me know and I’ll give you a great line-up of courses! Brian – although a trip out there probably isn’t imminent (this summer), I want to make it happen in the next couple years, and I will definitely seek your advice, and maybe we can even tee it up! Josh, I would like that.